When it comes to pedals, Strymon know a thing or two about a thing or two. However, even they have surpassed themselves with the new Sunset Dual Overdrive Guitar Effects Pedal, a tonal powerhouse that is a thing of unbridled beauty. After carefully studying six circuit types found in iconic overdrive and boost pedals, the team at Strymon endeavoured to combine them all in a single two-channel unit, and the result is the stuff dreams are made of. Enjoy! Having one exceptional overdrive pedal is great, but I think we can all agree that two is much better. Fully customisable, independently selectable, flexibly routable, and designed to complement each other when stacked, the dual pedals co-exist harmoniously. Whether you want to give you tone a wee boost, push your amp hard or anything in between, the Sunset gives you an enormous breadth of options to pluck from. Channel A offers up two overdrive circuits in the form of Ge and Texas. Ge combines a more subtle germanium diode response with a parallel path blend between dry and Drive. Ramp up the gain to reveal a lower-midrange response that is tightened up and thickened out - chunk out your single-coils and drive your humbuckers hard. The Texas overdrive utilises a single stage soft-clipper setup that creates a smooth and tonally dynamic drive. The dry signal is maintained alongside the wet to give a pronounced midrange presence that is great for fattened blues and rock licks. The treble booster does away with low frequencies when the Tone knob is turned up, which tightens up amps or pedals with a greater low-end emphasis. Alternatively, by rocking back the Tone knob, the low-end can be reintroduced - the choice is yours. Channel B is equipped with 2stage and Hard overdrive options. 2stage creates an output with greater complexity and a huge gain range. If you're looking for a weighty punch in your signal, this is the one for you. The Hard overdrive gives you the good stuff, a hard-clipping fuzz that can be sculpted using the Tone knob to take your signal from smooth to buzzsaw snarl. The JFET boost circuit is a remarkably clean signal boost the upholds the sonic character of your tone whilst rounded and warming at the same time - perfect for amps that need a little nudge in the right direction. As noted above, each channel can be used independently or stacked simultaneous to suit your tonal desires, and you're sure to have no end of fun finding your ideal tone. Strymon know that one size doesn't fit all when it comes to signal path requirements, and rather than stack their chips on either analogue or digital, they give us the best of both worlds - thank you Strymon! The ultra-low-noise, discrete, class-A JFET circuit offers up to 20dB of lush analogue gain. As well as this, the powerful SHARC digital signal processor is responsible for guaranteeing peerless signal complexity and responsiveness. Across the rear panel, you'll find a selection of connectivity options and controls that expand the range of possibilities on offer beyond your expectations. 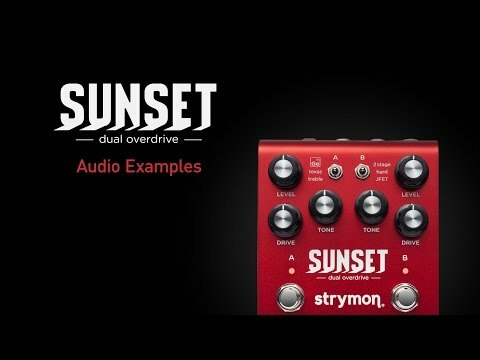 As with all Strymon pedals, the Sunset is designed to take the effort out of achieving exceptional tone, and whatever your rig, however you like to setup, this little dynamo will slip into your life like it's been there all along.